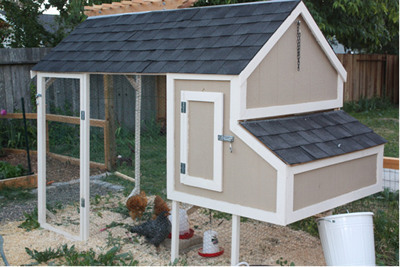 4 Essential Questions You MUST Answer Before You Start Your Chicken Coop! Home/How to make a chicken coop/4 Essential Questions You MUST Answer Before You Start Your Chicken Coop! In order to make the best chicken coop for you and your family, several factors need to be considered. You want the chicken coop most suited to your home environment... the coop that will allow your family to raise chickens in the easiest, lowest-stress, and most enjoyable way possible. First - What is the environment of your home and family? When I say environment, I don't mean how do all the members of your family get along. I am referring to the actual temperature and climate around your house. For example... Does it rarely get below 60 degrees Fahrenheit in your area? Does it snow, and get below freezing for two to three months out of the year around your home? Is the ground always wet and saturated around the location where you are planning on building your chicken coop? Does the sun ever shine where you are wanting to put your chicken coop? Each of these factors has a huge impact on how, and where, you decide to build your coop. Depending on the answers, you might decide to put a warming light in the coop, or use insulation in the walls. Secondly - What kinds of animals will come in contact with your chickens in the chicken coop? Again, answering this question will have a HUGE impact on what kind of coop you build, and where and how you build it. Eliminating predators is a big part of keeping your chickens alive, happy, and healthy. If you have bears, or raccoons, or snakes, or other types of predators in your area, you will need to build their predatory styles of attack into your chicken coop design. Some larger animals can only be stopped by electrified fencing. Wild birds will also have an influence on your coop building. Due to avian flu and other wild bird diseases, you may need to consider how you will limit access to your chickens from wild birds. While some other areas will have very little access to wild birds or animals, so it won't be very much of a concern for you when you plan and design your coop. Keeping wild birds out can be as simple as using ultra-small netting, or it might require a hard roof over the entire coop and run area. Third - Which type and size of chickens, and flock, do you plan to keep? This will also have a large impact on your chicken coop ideas. Some chickens... Plymouth rock or Cornish chickens, for example, which grow rapidly, are typically kept to provide meat. These chickens are also known as broilers. Other chickens, the leghorn varieties, for example, are kept for their prolific egg production. These chickens are known as layers. So, whatever you are hoping to get out of your chickens will influence the type of flock you keep. The size of your chickens will decide several things, including how much roost space you need or how big your nest boxes should be. Finally - After you've answered all three of the questions above, you'll be ready to answer this one final question about your chicken coop. Do you want it to be mobile or stationary? Based on many of the answers to the questions above you will come up with a decision for the style of coop you want to build. If your flock is large - above 12 hens, then you may need to go with a stationary (unmovable) coop, or you're going to need to build a couple moveable coops. If a small flock, then mobile is fine. If LOTS of large predators live nearby, then you're going to need a stationary coop with buried, and maybe even electrified, fencing. Building a chicken coop that fits your family and your lifestyle doesn't have to be hard, but it does take some serious thought and planning to get it right. If you can clearly answer the four questions above, then you should be well on your way to creating a great chicken coop for your home.